Seemingly confirming ongoing rumors that Apple's next iPhone will feature a redesigned 'True Tone' flash unit, an electronics wholesaler on Tuesday published high-resolution pictures of circular dual-LED flash assemblies supposedly bound for both 4.7-inch and 5.5-inch "iPhone 6" models. Purported 'iPhone 6' True Tone flash for 4.7-inch (left) and 5.5-inch versions. 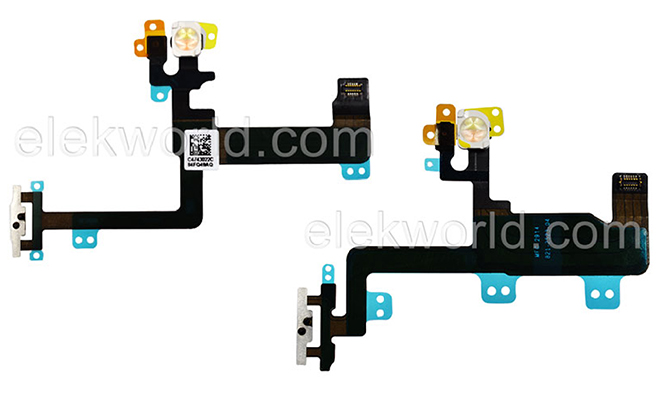 Following up on a parts "leak" earlier on Tuesday, Chinese smartphone repair company ElekWorld posted pictures of newly stocked parts, including purported "iPhone 6" power flex cables with round multi-colored flash assemblies. Offered in both 4.7-inch and 5.5-inch variations, both cables feature what appears to be a dual-LED flash assembly with "cool" and "warm" tints, a hallmark of Apple's branded True Tone technology. Further, the round flash lines up with a series of purportedly leaked iPhone 6 rear shells, each featuring a round hole for the rear camera's flash unit. It was previously speculated that the circular opening was merely a placeholder for what would ultimately house the familiar pill-shaped port seen in the iPhone 5s. Also worth noting is the location of the sleep/wake actuator, which resides on one end of the flex cable, opposite a low-profile connector. Judging by the positioning in relation to the flash unit, the button could be side-mounted as rumored in multiple reports. An identical component for the rumored 4.7-inch next-gen iPhone was seen amid a cache of purportedly leaked parts earlier this month. Apple first introduced the True Tone flash with the iPhone 5s last year, saying the dual-LED setup helps even out color temperatures in low-light situations for more natural looking photos.